I have just arrived in Queretaro and I am already in love. The city is an open-air museum, the historical centre is full of ancient buildings, old churches and museums. But as you know me the real reason why I have fallen is that I have found an organic shop that sells vegan stuff and a new cute café in my favourite style all grey and wooden, from which I am working on this article. 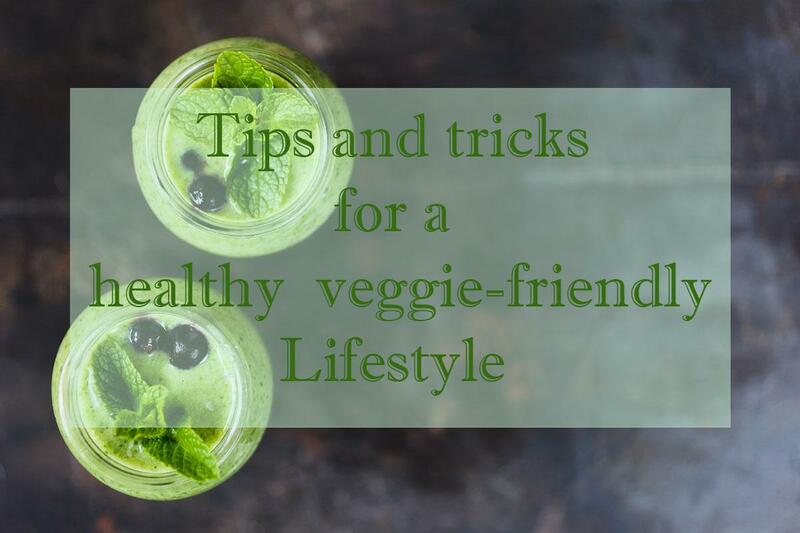 I have been wandering around the city fascinated by the historical buildings, the baroque architecture of the churches and … by the number of Vegan restaurants and vegan-friendly options in many other regular ones. 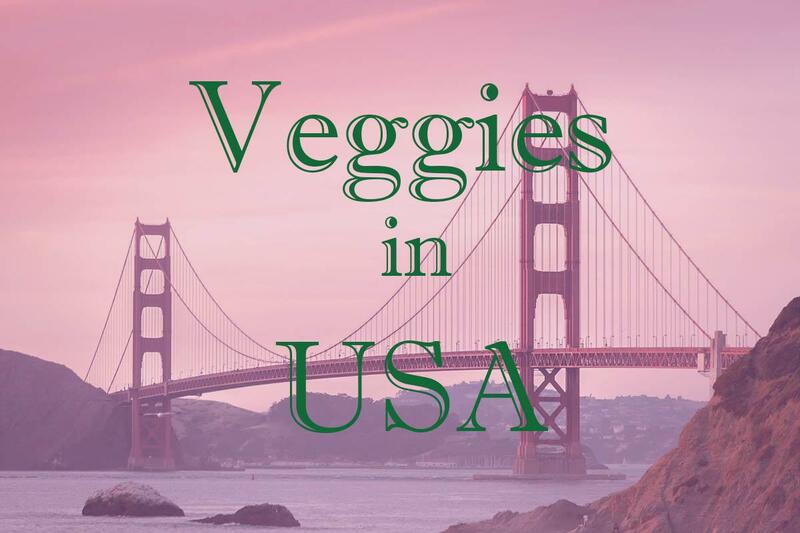 It is definitely a veggie-sensitive city. For research purposes (ONLY! 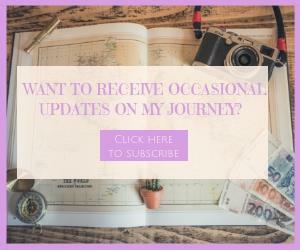 ;) ) I have been trying so many places in one week that now I am all ready to give you my reviews and tips on where to go and have your best vegan blast! This little and cosy place conquered my heart immediately, not sure if for the nicely colourfully painted walls, or the wooden furniture, some made of pallets, the bookshelf or one of the nice owners who came out and welcomed me with a huge smile asking me if I was looking for a vegan restaurant. 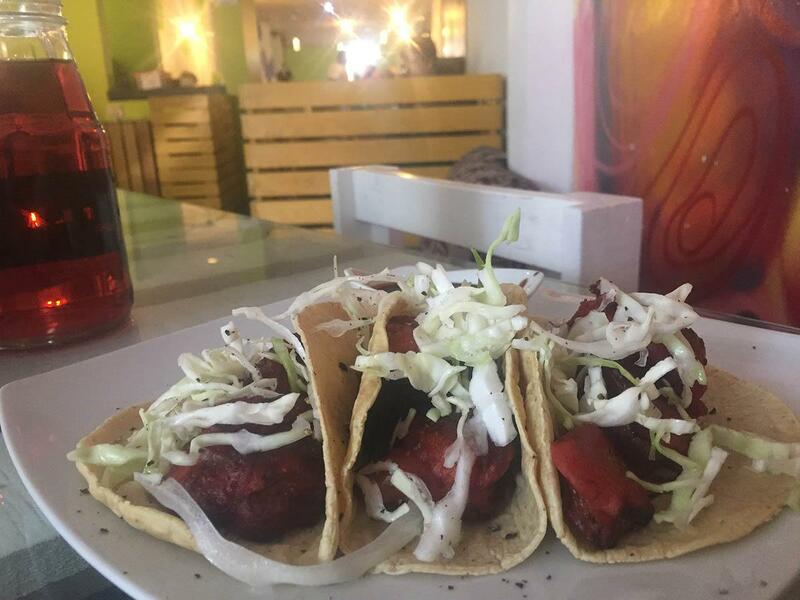 They offer a fixed menu for lunch that varies every day, for 130 pesos. It’s not a lot in general but it’s quite a bit for Mexico, but it’s all worth it. As the dishes are very elaborate and abundant. I got to try the spicy one and I am not really fond of spicy food but it was just delicious. 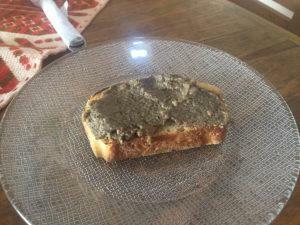 TEPENADE of Olives and mushrooms and garlic. Soup of runner bean (ayocote in Spanish). Very spicy. DESERT which was a pudding made with coconut milk and Mamey ( local fruit) and nuts. Open from 9 to 5 from Wednesday to Sunday and serve breakfast and lunch. Breakfast is a la carte. 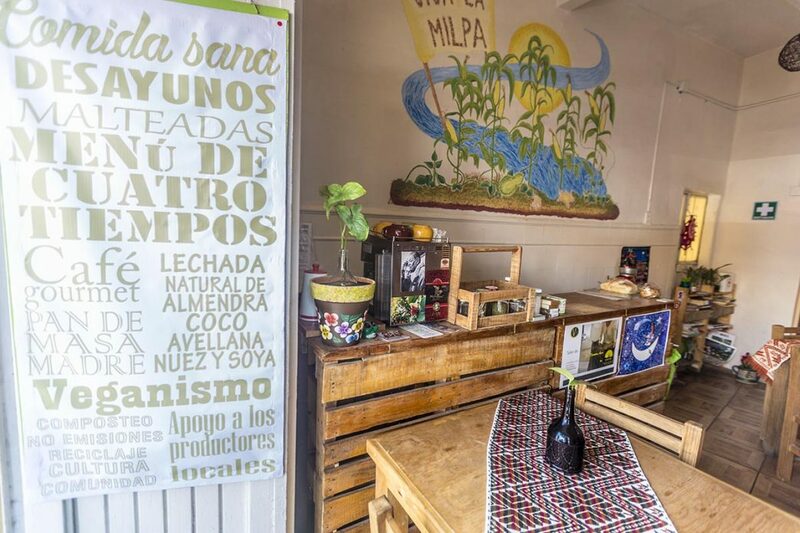 They have a rich menu for breakfast and juices and “licuados” made with nuts and dates fruits in all sort of combinations. 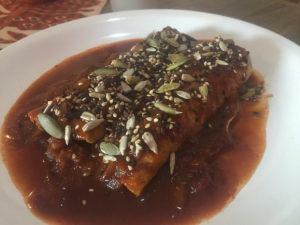 Breakfast varies from sweet with vegan hotcakes to sours with chilaquiles, enchiladas and hash…. You will certainly find your favourite dish. Located at 15 minutes walk from the historical centre, by the river, this little gem has just opened 3 months ago. It’s tiny but really cosy and welcoming. You have one big table to share with other veggie-eaters and a bar by the wall where you can also recharge your devices. 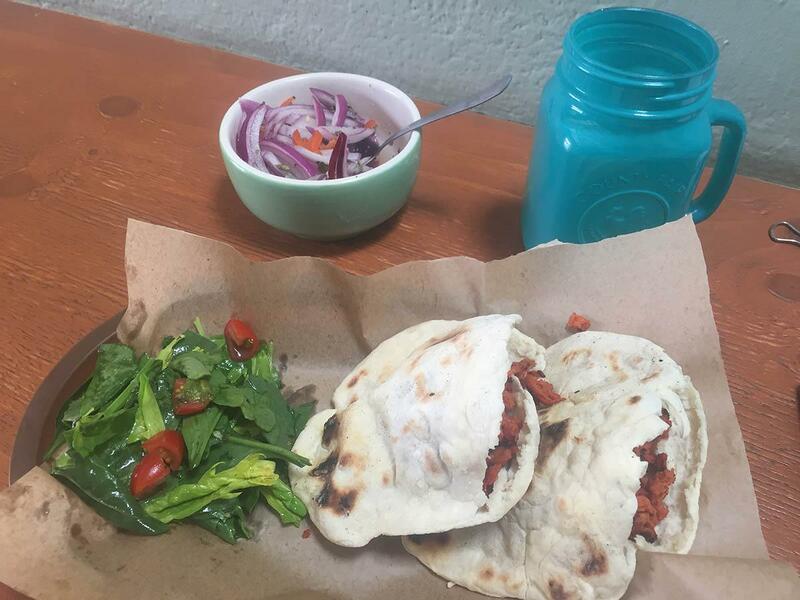 The menu is mostly Arabic oriented, with falafel and Arabic bread and hummus, but of course also tacos and cochinita pibil which is a Yucatecan dish made with meat, here is done with soy meat, which is what I had and it was delicious. They also specialize in vegan desserts and I had a brownie that I am still dreaming of now. Open hours every day except Sunday from 12 to 21. WIFI available. 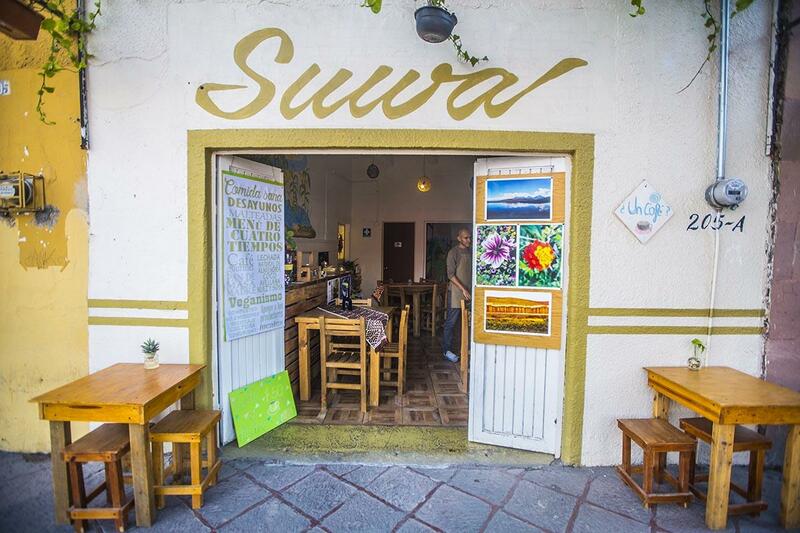 The colourful solar place offers 2 fixed menu which varies every day: the main one, of 65 pesos made of 4 small courses and a drink all vegan, and a 55 pesos one with only 3 courses. The day I chose they were serving a very chilly soup ( but delicious), a salad, 3 tacos with panfried mushrooms and dessert was a few pieces of fruits. The food was good and fresh and honestly, it’s more than you expect at the price of 65 pesos ( 4$). If you wish to have more elaborated dishes Suwa would be your option, for double the price. It’s a small and simple place which offers only one fixed menu that changes every day. You can check it on their Facebook page. It’s funny because if you go too late and they have finished the food they won’t be able to serve you. So it’s better to either go early or call them to reserve your spot. Open only for lunch. 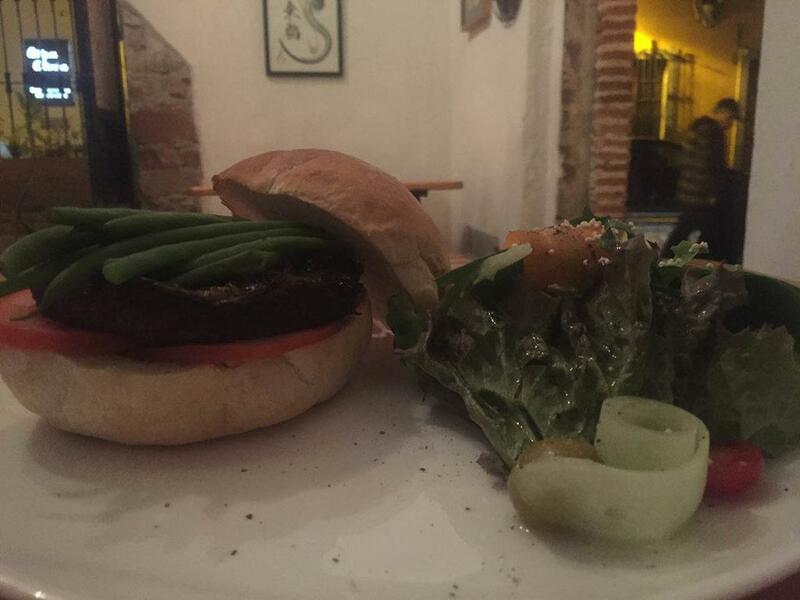 THE BEST VEGAN BURGER ever or I should say the BEST FOOD I have had in my life. This is how much I loved it. It was made with a huge Portobello mushroom, a thick and big one which was artfully sauteed before, one layer of green peas and one of tomatoes and some olive oil. It came with salad and potatoes pure, about which the owner had the sensitivity to inform me that it had a little bit of butter in it. Therefore he offered me a bigger salad, instead. I really appreciate those little gestures as they show care and respect for people’ choices. The bread was homemade crispy outside and soft inside and although I don’t normally like to eat white flours, I enjoy it once in a while and this was the right occasion because it matches really well with the juicy mushroom. The salad was not only delicious with a delicate sesame dressing but also nicely presented. It was a pure bliss eating it, almost mystical if you are a foodie like me. I found this place by chance as I was walking to take some photos around Plaza La Congregación and to the mirador. I was attracted by the entrance because it said “art gallery” and I could spot the external patio which was showing a lovely graffiti. When I stepped in, as I was admiring the art collection I was welcomed by the kind owner to whom I asked about any chance of having a vegan dish. Honestly, I was expecting a “yes we have a salad” as I usually get. Nothing like that, as he turned out to be perfectly aware of vegan and vegetarian needs and had a few dishes on the menu’ which offer both options. He spoke about this Portobello burger which caught my attention immediately, being mushroom my top favourite food. Without hesitation, I told him I would come back after taking some photos and so I did and ordered straight away my dish. I have never been so happier, especially when I realized that its taste was way above my expectations. I just didn’t want to finish it, although I was so full at the end. Also, I had a further look at the menu and they do offer other options, such as guacamole, vegan carpaccio, and other delish. Even if it is not a vegan restaurant per say, you can be reassured that they are vegan sensitive and very happy to serve us veggie-addicts. 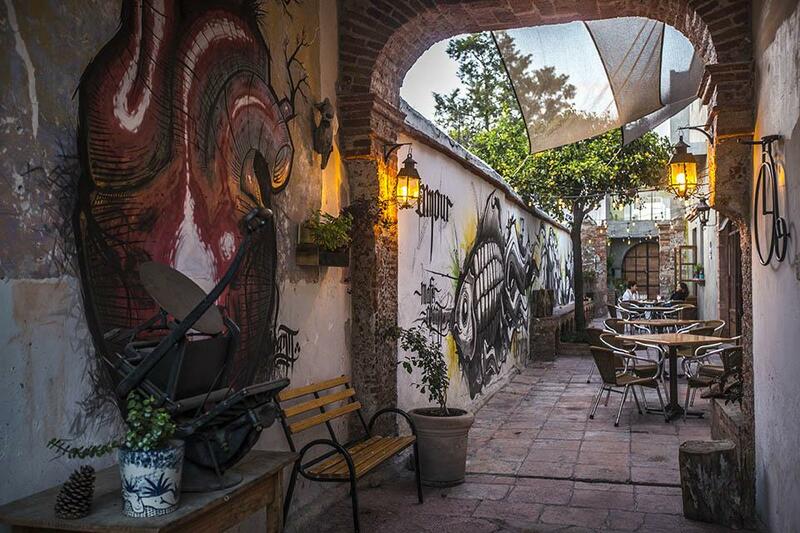 PS FUN FACT- the name of the restaurant TESGUINO comes from a drink typical of the Chihuahua’s ancient civilizations and it is made out of fermented corn, although the Tarahumara use to call Tesguino all kinds of alcohol, beers included. 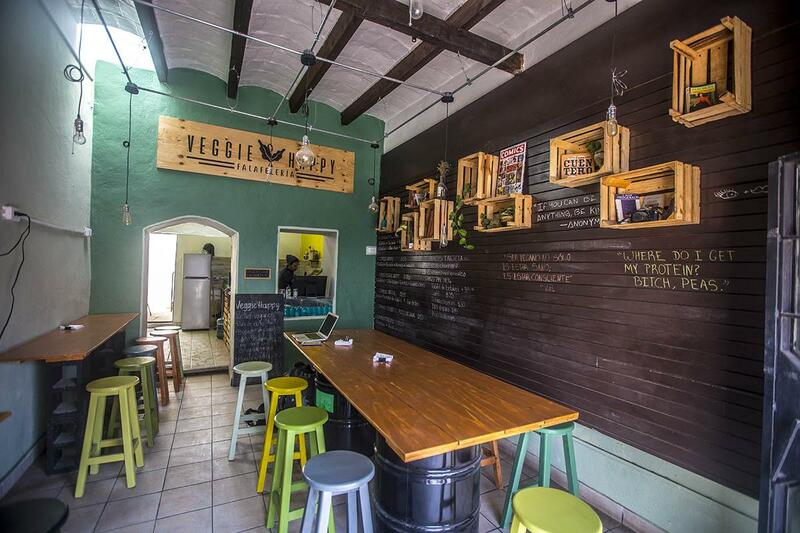 The owners of the place had the initial intention to make a brewery but because of bureaucratic issues, they decided to turn it into a gourmet restaurant offering different local specialities with an international touch and also a vegan/vegetarian one. Great choice and kudos to Mariano and Mariana for the great forward-thinking ideas. It’s a very peculiar place for its interior décor, all wooden and vintage stone walls and, with chocolate-theme decorations. They have a really dense menu for vegetarians who eat dairy products and a couple of options for Vegans but Let me tell ya! Those 2 options are really goods. The CHOCOLATE DE OAXACA is made with water cocoa and cinnamon, and sugar of course whereas, my favorite is the Agua de chocolate, which is made with water, cocoa and PINOLE, which is a product of corn, that gives the chocolate a very dense texture. It ‘s sweet and delicious but very light. Unfortunately, the service is really gross and unpleasant. Although when they talked to me they were kind, I felt like I was a bother. When I arrived all the waiters were eating all together and were taking turns to serve when they realized somebody was there, which I found quite odd. Their attitude, in general, I found it was a bit too impersonal especially compared to the kindness I have found in the other bars and restaurants in the city. The place is small and cozy and if it’s not cold, you can enjoy a lovely space outside on the plaza, AND, if cold, no worries because they have blankets for your perusal. This is awesome; it’s the first time I am seeing anything like that. The service is great, with smiling young guys looking forward to attending you. I just felt a very good energy about that place and for sure I will be back. 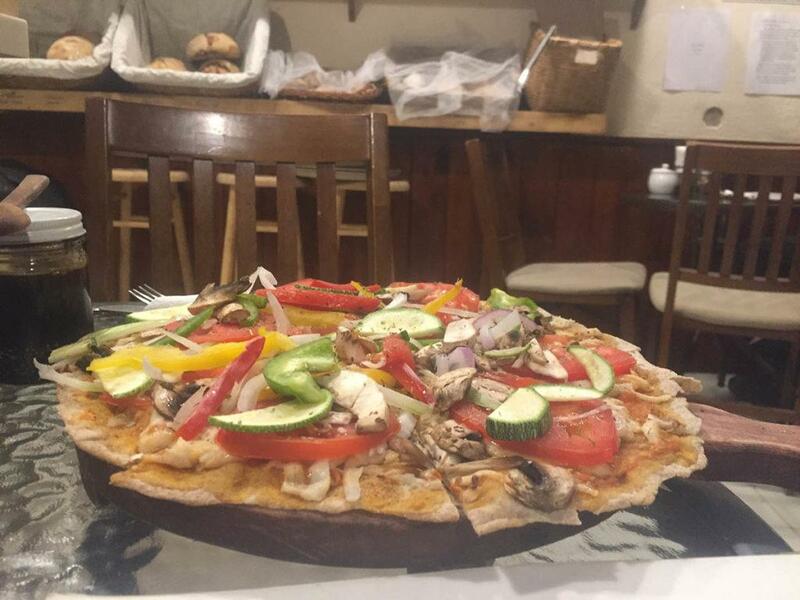 The menu is based mostly on pizza and bread, they also sell homemade bread loaf to take away. It’s a popular spot for the coffee and bread, in fact. If you are vegan, you can ask the pizza without cheese or vegan cheese which they have! 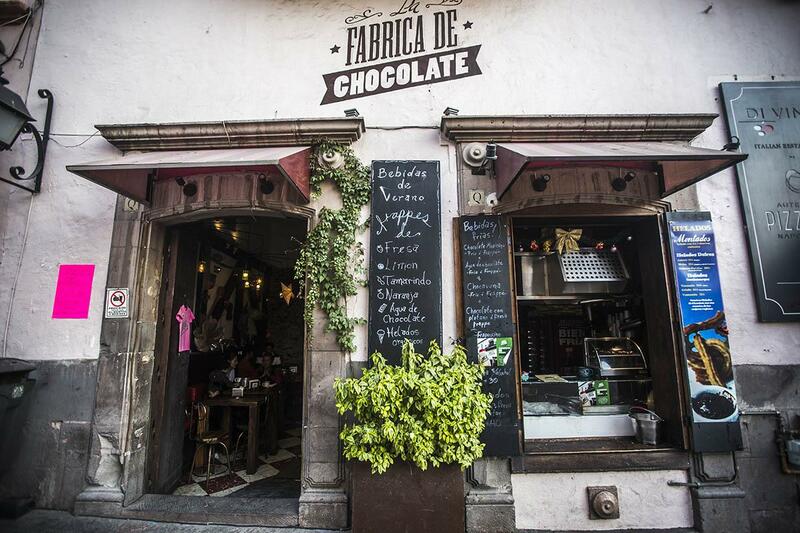 I just found out that they also have chocolate made with water and organic cocoa brought from Oaxaca, the mecca of chocolate, and it’s less expensive than the one in the chocolate factory. They also have delicious salads and Sandwiches with vegetables only. Among other beverages specially flavoured lemonades made with different kind of teas and a local soda called BUHO ( OWL, my favourite bird, by the way) which is actually made of natural fruit juice and sweetened with agave syrup (pure). Also, they offer a huge variety of teas and infusions and they have vegetarian milk options of rice or soy milk. A joyful place indeed where I would go back many times. And I can see I am not the only one who thinks this is a special place as I have arrived right on time to find an empty table; 5 minutes later I would see crowds looking for a table in vain. This was a pleasant surprise. 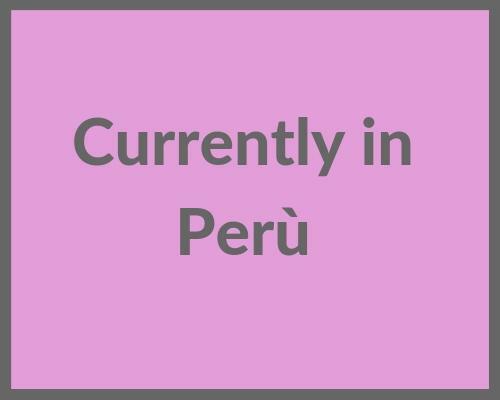 It came out in my google map search of vegan restaurants and I had no idea on what to expect because I had just checked another one called NATURA, still showing in the map, which was not the least attractive. On the contrary, Café Maco turned out to be a real gem, although not properly a vegan restaurant but with a huge menu that would make anybody happy. They have a fixed menu which changes every week and they have the vegan, vegetarian and omni-eater options. 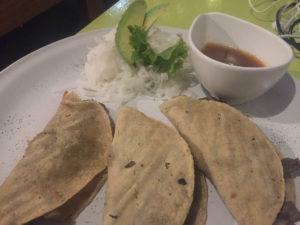 However, on the list you can find a huge variety of vegan or vegetarian specialities from mushroom tacos to different kind of kinds of pasta, soups, sandwiches and salads, not to talk about fresh juices of all sorts. It’s a very popular place among locals and now that I have been there I understand why. The interior decorations are one of a kind. I couldn’t tell what kind of art it is but walls and doors are all painted with all sorts of colours and themes and crazy stuff is hanging from the ceiling, not to mention the writings all over the place in every directions and font. It has 4 different rooms with different layouts and sitting options. When I looked at the long menu I was disappointed not to find anything vegan or that could possibly be adapted and I opted for granola and fruit, which I was happy with anyway for being a healthy option. However, when the waiter came to take the order I tried and asked him for vegan options he was surprisingly ready to answer with 3 dishes that could have been adopted to a vegan plate substituting the cheese with avocado and mushrooms (which I love). The bread that was coming with the menu was vegan too. As hungry as I felt, I was over the moon. 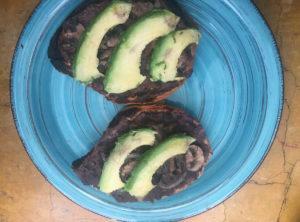 I had molletes, which are two pieces of bread with beans pure avocado and mushrooms. They turned out to be delicious, as was the bread. They also have café de olla, which I love as it is made with piloncillo ( a derived from sugar cane) and cinnamon. Don’t have wi-fi and only accept cash. Open from 9 to 14 and from 18 a 23 . Sundays closed. Quite an elegant restaurant in a strategic location with a lovely external terrace. It’s a Mexican restaurant with a Mediterranean touch. Their dishes are very original and nicely decorated. The service is impeccable. They do offer vegan-friendly plates. I had a good seta soup (just remember to ask not to put chile if you don’t like spice and don’t trust when they say it’s not spiced because the Mexican concept of spicy is much different from the rest of the world. I was on fire but they were so kind they offered to change my soup and although I didn’t accept it because I was almost at the end, I really appreciated the gesture. That is what makes the difference in service. 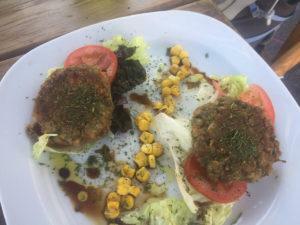 The main course was made of lentils burgers and they were just mouth watery, accompanied by a little salad. As I couldn’t have the desert on the menu because it contained dairy products they offered me coffee. Kudos for the service… and the food. That’s it for now. If you have anything to add please feel free to leave a message in the comment below.